Jaiveer Shergill studied at St. Jospeph's Boys School and APJ School in Jalandhar. He did his LLB from West Bengal National University of Juridical Science and then his LLM from UC Berkeley School of Law, University of California. He is a practicing lawyer in the Supreme Court of India and a politician belonging to the Indian National Congress party. 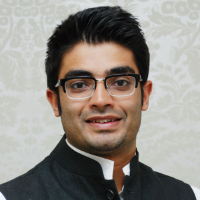 He is the Youngest Spokesperson of Congress, AICC National Media Panelist and Congress youth leader Punjab. Politics is the art or science of government or governing, especially the governing of a political entity, such as a nation, and the administration and control of its internal and external affairs. "After doing my bachelors degree in law from Kolkata, I did my masters from University of California. I am a practicing lawyer in the Supreme Court of India and a politician belonging to the Indian National Congress party."